Three Fresh and One Frozen | What Goes with What? When McDonald’s rolled out its fresh beef quarter pounder I resisted the urge to rush right out to try one as I was waiting for a better reason and here it is – this month’s Whine, the fast food burger rematch. I’m not a fan of the big time fast food burger restaurants, the Mac, Wendy’s or Whopper as I’m willing to put out a few more dollars to enjoy a better burger at a one off local place (Big Guy’s and Scratch Kitchen in Forest Park and Super Burger and Phyllis’ Giant Burger in Santa Rosa) but I do fawn over Carl’s Jr. and it’s one of the reasons we moved here (smile) but I digress. Loyal readers will recall that I did a casual burger review about three years ago with McDonald’s besting Wendy’s and Whopper mostly as a result of better burger construction and attention to detail. So now with fresh beef on the menu at three out of four of this year’s contestants I’ve taken another bite…and included a west coast favorite. So we did our best in going apples to apples and chose a quarter pound burger sort of plain with only cheese and whatever sauce or condiments were included. We also ordered the standard issue or deluxe burger with the advertised toppings, lettuce, tomato, onion and pickle. Research tells me a great burger has an ideal ration of 50% meat to bun and toppings. Most fast food burgers hardly achieve a 30% beef to 70% toppings ratio but that’s how they keep prices under $5.00. Now to the tasting results, least liked to the best. Wendy’s and Burger King flipped from our last outing as the Wendy’s burger was not an attractive combination. “It’s our classic the way Dave intended! A juicy quarter pound of fresh, never frozen beef decorated with premium toppings all between a warm toasted bun”. Well my guess is whatever Dave may have intended and what we got are two very different things. Not much to say about Wendy’s Dave’s single with only cheese and “Dave’s Mayo” – $3.99. Boy, plain is plain, couldn’t eat one on a regular basis. The bun is bready trying to be a fake brioche and fails, horribly; Meat patty is OK, would give it fresh but not flavored well. 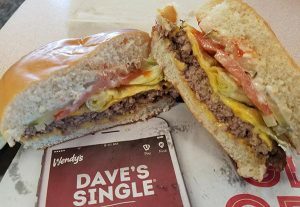 Dave’s Single with everything, $3.99 – of course has the same odd bun flavor that distracts from the sandwich, the whole thing seem confused. Nothing unpleasant but I won’t be getting another one. This could be a local franchise issue. The taste of a backyard grill, flame-grilled beef, American cheese, tomato, onion, iceberg lettuce, and dill pickle, a dollop of mayo, a squirt of ketchup, and a sesame seed bun. There is absolutely nothing novel about the Whopper – and that’s what makes it so comforting a flavor to so many people. 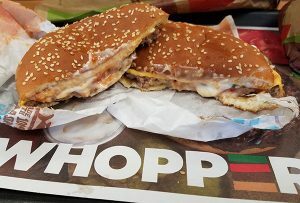 Burger King claims to be the Home of the Whopper, but our sandwiches looked like they accidentally placed that home on top of the Whopper before it was delivered to us. Check the picture. Whopper with cheese is a 4 oz. frozen patty, $5.19 (+ $.60 for cheese = $5.79) The bun is compressed and doughy and doesn’t taste toasted in any fashion but there is a big bite of pickle. There is some beef flavor in a bite of sandwich and a bite of the burger patty alone is decent but not beefy. Over all fair taste. Whopper with everything, $5.79 – classic whopper taste but beef flavor is lost in toppings. The bun is still a negative issue. Over all decent taste but not really something I’d look for. A lot of double wrapped paper for an eat-in sandwich with no attempt at recycling even in Cali. The tasting panel easily picked the Quarter Pounder as the best of the three national chains with the fresh beef making a real difference. The brand has its own unique flavor profile that keeps it afloat (when you crave a real burger, McDonald’s won’t do, but on the other hand, when you crave McDonald’s, no other burger will either). The Special Sauce is of a thousand-island style that I can’t imagine enjoying it on a salad, but it’s a key flavor to the rest of the sandwich. Quarter Pounder with cheese, pickle, ketchup and onions – $4.99. The bun looks remarkably similar to BK’s but is well toasted and still looks like a bun. The thicker, fresh beef patty and “Special Sauce” creates a good beef flavor mix. A bite of burger meat alone is very tasty and flavorful, big improvement over the original. 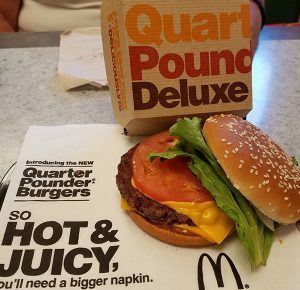 Quarter Pounder Deluxe with cheese lettuce, tomato and onion – $4.99. Even fully dressed there still good meat flavor in the mix. It’s a pretty tasty sandwich for FF but may have too much mayo for some. Again way over wrapped paper and box packaging with no recycling on site, a real waste. This is a second generation family run operation. 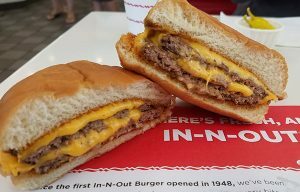 They never open a location more than a day’s drive from their meat processing plant in Baldwin Park, California, just north of Anaheim. Recently they closed some 35 restaurants in Texas because they weren’t using the correct buns (what up Wendy’s). I have discovered that the chain and I have something in common; we both opened in 1948. Looking at the picture what do you see that’s different, 1,000 points if you said, “the burgers on the top.” They do a bottom load, spread (mayo based thousand island), veggies and then the beef and cheese that melds the flavors together enveloping the burger, you mouth tastes everything differently. Try turning your next burger over before you take a bite and see if it tastes different and you’ll say my name out loud; “stupid jerk”. The tasting panel agreed that is was the best burger we sampled and at a price range of a dollar less than the national chains, it’s easy to understand the long lines at the drive-up and waiting for seats inside. Basic Double-Double is two paddies and two cheese slices $3.85 First bite has lots of flavor from the meat and cheese, bite of meat tastes really fresh. The panel agreed there seemed be a touch of saltiness in various bites but not always, so was the meat salted at random before or as it was cooked? Bun is terrific, nice piece of bread. Regular Double-Double Burger – $3.85 Good veggies and meat really stands up to the other flavors again with the reverse stack. Each item in the sandwich tastes of high standards. 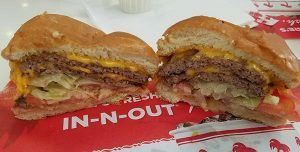 In-N-Out faces some direct competition from The Habit Burger Grill based in Southern California. They feature the same style burger at the same price but also have a sandwich menu that includes tuna and tri-tip at the $10 range. They will have opened a store in Santa Rosa as you read this and the tasting panel will report soon. Hungry now? Some late breaking news in the online edition; The four major burger chains Wendy’s , Burger King, Jack in the Box, Taco Bell and McDonald’s (69 ) are on the bottom of a customer satisfaction survey complied by Quick Service Reports (QSR)that shows Chick-fil-A (87)and Panera Bread as one and two. “The American Customer Satisfaction Index is based on interviews with 22,522 customers…chosen at random who rank customer expectations, perceptions of quality and perceptions of value”.